Karen Welch leads a roundtable discussion for "Live Here." In observance of Martin Luther King Jr. Day, Panhandle PBS will rebroadcast a special hour-long episode of Live Here on Thursday. "What Matters Now," which originally aired Sept. 8, will encore at 7 p.m. Thursday. 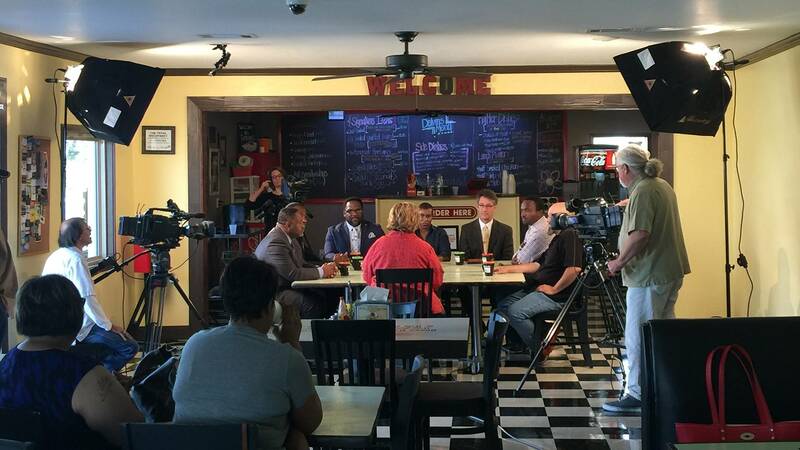 In the episode, filmed at Delvin's Restaurant and Catering in Amarillo's North Heights neighborhood, several community leaders and average citizens came together to discuss the issues that spurred the Black Lives Matter and Blue Lives Matter movements. The participants include Ed Drain, Amarillo police chief (then in an interim capacity); Julian Reese, Amarillo Venom coach and founder of the Urban Project; Dr. James Tudman, a pastor and representative of the Community Alliance of Leaders and Law Enforcement; Walt Weaver, an Amarillo criminal defense attorney; Thomas Jones, Potter County justice of the peace; Mike Gay, who runs a local conservative online radio site; and Jill Bempong, community volunteer and mother. "When we decided on the show, we knew we couldn’t possibly record a definitive conversation about relations between black residents and police. After all, any successful dialogue must go on after the cameras shut off," said Karen Welch, senior content producer and host of Live Here. "But we could pay attention to the details, take care in the decisions." The previously scheduled episode — Witness, about an Amarillo man's grandmother who rescued refugees from the Holocaust — will air at a later date.